Steeply pitched roofs with gables rather than hips were a typical characteristic of the larger, two storey examples, though small suburban houses often had a combination of hips and gables. Walls were usually sheer rather than textured and ended flush with the gable of the roof. Sometimes manganese bricks or tiles or tapestry bricks were used to highlight openings and to decorate walls. Picturesque asymmetry was attained through double or triple fronts to the facade, arched porch entries, large, prominent chimneys and, in larger examples, oriel windows and towers. Porches were generally small, and the traditional Australian verandah was not included except in some hybrid examples. Windows were of the sash or casement types, and often featured twelve panes or diamond pattern leadlight. Muted colours were appropriate to this style. Cream, off-white, buff, stone, terracotta and dark brown were most popular. Dark stained timber and red brick were the dominant materials, and cast iron painted black or a dark chocolate brown was also common. A number of new economies in materials facilitated the rise of the English Domestic revival. The increasingly availability of seasoned hardwoods made possible the use of brick nogging and half-timbering, even in the most modest house. Added to this was the introduction of terracotta shingle tiles, manufactured by the Eureka tile company in their Ballarat kilns. associations through picturesque massing of gabled and hipped roofs and through the application of elements such as leadlight windows. Architects also looked to the vernacular of Normandy for inspiration. Architect Robert Hamilton was recognised as the foremost practitioner in this style, designing large and impeccably detailed houses and luxury flats. Other architects strongly associated with Old English/Tudor Revival include Philip Hudson, Eric Beedham and Arthur Plaisted. The use of an external expression drawing heavily from medieval precedents became a means of expressing the solidity and longevity of British traditions. Old English or Tudor styled houses were associated with a profound Empire consciousness. Larger houses of the type exploited the associations of the manor to convey wealth and social status. A large Tudor house, no matter how new, somehow conveyed a sense that wealth, even recently achieved, was permanent. So common was the use of this idiom within the nouveau riche enclaves of Toorak and South Yarra that the essentially British term ‘Stockbroker Tudor’ gained popular usage. A major source of the English Domestic Revival or Old English styles is the work of English architect, Phillip Webb (1830-1915), particularly his Red House at Bexley Heath of 1859. Webb’s designs were simple but always picturesque adaptations of Tudor architecture and became a model for much domestic architecture in Britain from the late 19th century to the second world war. The main architects of this revival included Webb, Richard Norman Shaw (1831-1912), and CFA Voysey (1857-1941). Design in a true Old English mode runs right through the 1920s but it gained much greater momentum from the early 1930s as the bungalow and Spanish Mission began to wane in popularity in Australia. From this time it was taken up by a far greater proportion of the architectural profession, and began to appear as a builder’s expression. Some of the more progressive designers in this mode, such as Edward Billson and Osborn McCutcheon, incorporated modern planning with careful zoning of spaces according to function. Few houses designed by either architects or builders took the opportunity to break away from revivalism in Old English design other than through the process of progressive simplification, the hallmark of late 1930s stylism. As the decade drew to a close the sentimentality and strong British associations of the academically detailed Old English were replaced by an expression which drew ever closer to the post-war multi-fronted multi-hipped and unadorned Australian suburban vernacular. A substantial number of residences drawing inspiration from English Domestic revival sources were built in the well-heeled suburbs of Stonnington during the interwar period. An extremely imposing Old English style building, it is of particular note for the massive two storey form and the large terracotta shingle roof, slightly curved out at the eaves. A very intact and detailed Medieval revival house with half timbering, tile hung wall shingles, patterned brickwork, terra cotta shingled roofing, and leaded glass. Apart from its early use of the suburban Old English style (or `Stockbroker Tudor’), this house is unusual because of the number of times it appeared in the national home magazine, `The Australian Home Beautiful’. This house was built c1936-1937 for Edith K Noonan to designs by architect A Mortimer McMillan. The substantial English Domestic Revival style house at 46 Albany Road, Toorak was built on land subdivided from grounds of the nineteenth century mansion Yar Orrong. The latter has substantial additions and alterations. is not as intact as some other individually significant examples listed above, but displays a similar high architectural quality, exemplifying architect A Mortimer McMillan’s talent for design in the Old English mode. 3 Hopetoun Road was built in 1932 to the design of Arthur and Hugh Peck on part of the ‘Holmby’ estate. on Crown Portion 25. The Macdougalls retained ownership until 1979. One of the more impressive Old English revival style houses in Toorak, and an excellent example of this popular style. Its importance is in exhibiting picturesque romanticism and for the detailing and impressive articulated forms which create a strong aesthetic character. 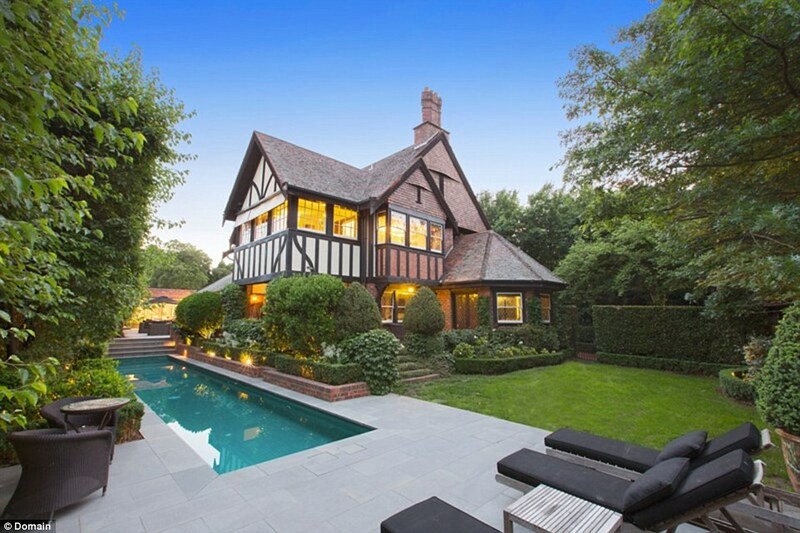 This is one of the more impressive Old English revival style houses in Toorak. The strong presentation to the street is·a consequence of the wide building frontage, the scale of the hipped roof and three projecting gables as well as the symmetry of the main structure. The richness of detailing and articulation of forms augment this impressive character with picturesque romanticism. This two storey Old English style mansion features a main hip roof with three matching projecting gables facing the street. The central bay is extended with a projecting flat topped portico with a large Tudor arch. This has an angled bay window above, whereas the side gables have a row of leaded glass casements creating a horizontal band.in the Elizabethan manner. The gabled ends have a halftimbered patterned design. The half timbering extends with vertical strapwork down to the first floor level on these bays, forming window surrounds. The building is predominantly finished in render with mouldings around the Tudor arched porte cochere. Clinker brick has been used to provide a contrast to the render. Highlight areasinclude the half timbered window surrounds and central gable, window openings and the porte cochere. The brickwork contained by the half timbering is of a diagonal three brick basket weave design, reflecting traditional brick nogging. The original design was symmetrical except for the side garage. The fenestration comprises both diagonal leaded glazing for windows within decorative half timbered areas, and double hung widows (some with shutters) elsewhere. :There is a central canted bay stair window. Old English revival Style included Tudor and medieval influences, reflecting British nationalist sentiment both in Britain and Australia in the inter-war period. There was a strong sympathy with Tudor architecture in the early 1930s by ·leading architects in Melbourne. The availability of clays suitable for making red clinker bricks and terra cotta tiles that reflected English usage provided a further justification for this style. Hugh Peck, like is father was a distinguished architect who was very patriotic about Australia’s’ relations’with England. This is demonstrated in this design. This building was designed at the high point of the popularity of this style and before many of Robert Hamilton’s best known works, possibly the most prominent exponent. This work can be compared favourably with much of Hamilton’s work especially Denby Dale (1938). In 1901 Malvern Hill Road was renamed Hopetoun Road in honour of Lord Hopetoun, Australia’s first Governor General. Henry Noye’s house ‘Holmby’ had been built up by the purchase of a number of separate allotments and the landholding extended from Malvern Road to Church Street. Noyes died in 1922 and the family returned to England. ‘Holmby’ was sold to Philip Pullar, an orchardist, in August 1925. The following year Pullar subdivided the property and sold the allotment fronting Church Street, which became the site of ‘Home Lodge’, the present house at 5 Hopetoun Road. Following Pullar’s death in 1929, the allotment between ‘Holmby’ and ‘Home Lodge’ was sold. (‘Holmby’ was later demolished and replaced with ‘Hopetoun Flats’ at the corner of Malvern Road). In 1932, plans were submitted to Malvern Council for ‘‘Glenholme’ Hopetoun Road Malvern for K.D. Macdougall’ by Arthur Peck and Hugh L. Peck architects 99 Queen St. Melbourne. In September 1933, The Australian Home Beautiful featured the Hugh Peck designed sun-room at ‘Stenholme'[sic],describing the ‘delightful room [as] a wide and spacious sun-trap with its picturesquely-glazed wide and arched windows’ [see full extract attached] . Kenneth Macdougall retained ownership of the house, which was numbered 3 Hopetoun Road, until 1979, when the property was sold. This extends down from the main ridge in a continuous plane over the porte cochere where it curves out to the gutter line. It has aprojecting hipped dormer above the porch and a series of gables at the other end. The chimneys are also striking features rising in simple tapered forms to terracotta chimney pots. The main walls are rendered with subtle quoins to the returns of the columns of the wide porch with Tudor arches and mouldings. Relief is provided to the render on the chimneys with some projecting face bricks at random space and a decorative ‘S’ plate. There is half timbering on one upper level window bay, manganese or clinkers. The windows have diagonal leaded glazing upstairs and downstairs. The deep front garden is formed around the return drive, which has a simple basket weave pattern with a central grass strip, all finished in clinker bricks. There are two gateways and a huge deep garden which features massive oaks and a Eucalyptus citriodora. Other trees in the garden are cedars, elms and two very large River Red Gums (Eucalyptus camaldulensis) on the street alignment, major landmarks on Glenferrie Road and possibly indigenous remnants. The front fence is a simple affair, presumably original, with double gates, including a separate pedestrian gate on the north side, with brick piers of a light clinker finish; the main fence is of dark stained jarrah planks. The property is apparently intact with respect to the principal features. Contributory, regional significance: A2 grading. Heritage Overlay Number HO62. It is similar to the work of architect Robert Hamilton. It appears to be very intact. The house at 11 Grosvenor Court Toorak is an imposing double-storey Arts and Crafts style residence with limestone clad walls. The house at 11 Grosvenor Court, Toorak is a double-storey limestone clad Arts and Crafts style building. It was designed by architect Bernard Sutton and built c1936 on land subdivided from the nineteenth century mansion Grosvenor. 11 Grosvenor Court has a spare and elegant quality derived from the strong massing, stone cladding and steel framed windows. The simplicity of the detailing, especially the absence of facias at the gable ends strengthens the imposing design. It has a quality that can be found in refined early twentieth century English work where Arts and Crafts principles were adapted to a modernist approach, stripped of fussy detailing. It is similar to the 1933 house at 3 Benson Avenue, designed by Walter and Richard Butler. 11 Grosvenor Court lacks the rusticated random blocks of 3 Benson Avenue but is more refined with respect to details and materials. The use of ashlar stone cladding at this period for domestic architecture is of special note. The house at 11 Grosvenor Court is an imposing double-storey Arts and Crafts style residence with limestone clad walls. The street elevation is dominated by a central projecting full height gable and two subordinate lower gables which flank this central element. The three gables project from the principal transverse gable. The roof is steeply pitched and slate clad. The windows are of simple-steel framed casements of a neo-Georgian design. The rear garage is original and has a slate roof facing the street. The front fence is of random coursed ashlar construction with colour variations creating a rustic effect in contrast with the dressed limestone walls of the house. Apart from its early use of the suburban Old English style (or `Stockbroker Tudor’), this house is unusual because of the number of times it appeared in the national home magazine, `The Australian Home Beautiful’. It was pictured in the cover twice and in detail in another issue, making it among the most publicised suburban home designs in the inter-war issues of the periodical. crazy or random paving to the entry and driveway median strip. The main elevations (east and north) followed on from those used in the Federation, Queen Anne and English Domestic Revival styles, with the projecting gabled room bays as the main elevation element, with extended gabled roof-lines reaching from the upper level eaves to the lower to produce the traditional attic form. The `loggia’ shown on plan at the north-east corner is framed by the hand-hewn oak brackets typical for the style. `The Australian Home Beautiful’ of 1931 noted the front door as a `sturdy affair in oak’, oak being also used for wall panelling and other joinery internally. In 1929 Arthur H. Stallwood, a banker, purchased the allotment in Monaro Road from Mrs Mary Ross. In 1930 an 8 roomed house was built on the site for an estimated sum of £5400. The house is pictured on the 1931 covers of `The Australian Home Beautiful’ both February and July editions. In 1931 `The Australian Home Beautiful’ featured exterior and interior photographs and a floor plan of the property. 1954 Stallwood sells to G. W. Wilson. 1962 Jorgensen and Anor purchased the property 1965 sold to Cook. 1973 Building permit applied for additions, $4998. 1976 Building permit applied for alterations, $3500. `The Australian Home Beautiful’ of 1931 stated that oak was used for wall panelling and other joinery internally, such as the shelf to the `texture’ brick fireplaces. The fireplaces were set at an angle across the corner of the main rooms, typically for the era. It also noted the clever use of the entry and stair hall for front and rear entrances, the latter from the garage (since demolished). The published plan also had a `loggia’ shared by the dining and living rooms, a device typically used in Mediterranean or Italian Villa style houses but obviously also a useful element in the Old English style. The kitchen opened into the dining room and connected to the maid’s room, by then a rare item in house design. Upstairs there were three bedrooms, sewing room, bathroom and a generous north facing balcony to the master bedroom. Ample built-in furniture was provided. This large attic-form Old English style clinker brick house was built in stages, the first designed by noted architect Robert Bell Hamilton. A major but sympathetic extension to the west was made prior to 1932, doubling the width of the building. The dominant element in the design is the terra-cotta shingled roof: a combination of steeply pitched hipped and gabled roofs, with skillion roof forms over ground level room bays. The two main gables are clad with stained vertical boarding, one on the east being from the first stage and the other, above the entry, being from the 1932 addition and houses a balcony. A third gable faces east, containing another balcony. Diamond paned timber casement windows in the front elevation enhance the English vernacular associations. The picturesque combination of roof forms resembles the work of the noted English Arts & Crafts architect, CFA Voysey, while the emphasis on natural and rustic materials such as the rough and irregularly coloured clinker brickwork, the fine shingles and the stained timberwork, reflect the strong influence of the Arts & Crafts. A low brick front fence encloses a garden of shrubs and mature trees. A semi-circular driveway winds past the large entry at the centre of the front facade. 1922 J Johnstone declared a plan of subdivision of part of CP15, Parish of Prahran, that contained a resubdivision of LP10555: it held four lots, this property being lot 4. 1922 In October architect Robert Hamilton purchased lot 4 of Warrawee Estate from Mrs George Moore, the owner of Warrawee. 1923 The MMBW plan of drainage 13125 for the house has Hamilton as the owner (and designer): it was drawn June 1923 and the work carried out by April 1925. The MMBW Field Book 2192: 81: shows RB Hamilton as the owner of a new house, the drawing of the house plan and drainage was signed May 1923. 1924-5 Hamilton is listed as the occupier of the new building. The house was later named Telgai and owned and occupied by Alice and Heaton Clark until at least 1960. 1932 MMBW Plan of Drainage 13125 shows doubling of house built frontage with an addition on the west, the architect is assumed to be Hamilton, the agent is again TF Crabb’ of Elizabeth St, Melbourne; the owner was now Alice N Clark of Struan St.: the name of the house was `Talzie’. Robert B Hamilton calls tenders for alterations and additions to a 2-storey brick residence in Struan St, Toorak: the successful builder was TF Crabb TF Crabb, builder, receives building permit for brick additions worth £760 for Mrs Heaton Clarke, owner. 1930s-1950s Victorian directories show Heaton C Clark in residence. 1968 Heaton C Clark dies, with his obituary stating that he was Chief Engineer for the Metropolitan Gas Company from the 1920s to his retirement in 1954. He died at Victoria House Hospital, Toorak, aged 79. The house at 46 Albany Road stands on the north-east corner of Albany and Kooyong Roads. The house is architecturally significant as a large, skilfully designed and generally well-preserved English Domestic Revival style interwar residence. This is a large and picturesque double storey English Domestic Revival style residence with its principal elevation aligned to Kooyong Road. The roof is composed from a series of hips and gable ends with terracotta shingle tile cladding and tall sturdy brick chimneys. External walls are mostly of clinker brick with plain rendered surfaces used sparingly on the Kooyong Road gable ends. The plain rendered walls are enlivened by fine brick detailing, including herringbone bond infill above the entry porch and irregular panels of darker thin bricks on the gable ends. Timber framed windows with leadlight glazing add further to the house’s romantic Medieval character. The house remains substantially intact externally apart from the c1938 lift addition and the larger scale c2012 attic storey addition to the garage at the Albany Road end. These works were sympathetically detailed to match the existing house and have not undermined the integrity of the original A Mortimer McMillan design. 46 Albany Road is not as intact as some other individually significant examples above, but displays a similar high architectural quality, exemplifying architect A Mortimer McMillan’s talent for design in the Old English mode. The original external form, materials and detailing. The high level of integrity to its interwar appearance. The unpainted state of the face brick and terracotta elements. The substantial Old English style house at 1 Chesterfield Avenue, Malvern was constructed c1928 to designs by architects Hudson and Wardrop. It was built on a nineteenth century subdivision, at a time when Malvern was experiencing a major growth in suburban housing. 1-Chesterfield-Avenue-Malvern.pdf The large Arts and Crafts style house at 10 Whernside Avenue, Toorak was constructed c1918 on land subdivided from the grounds of the nineteenth century Whernside mansion estate. The house at 11 Grosvenor Court, Toorak is a double-storey limestone clad Arts and Crafts style building. It was designed by architect Bernard Sutton and built c1936 on land subdivided from the nineteenth century mansion Grosvenor. 11-Grosvenor-Court-Toorak.pdf The house at 13 Myamyn Street, Armadale is an attic storey English Domestic Revival style building with Shingle style overtones. It was built c1926 to designs by the noted interwar architect Robert Bell Hamilton. Wiltondale, 25 Heyington Place, Toorak was built c1929 to designs by architect Robert Bell Hamilton. The property originally formed part of the Beaulieu (later Kilbride) mansion estate, and in recent decades was incorporated into St Catherineʼs School. The house at 2 Ledbury Court, Toorak is a large, double-storey Old English style residence designed by architect Charles Neville Hollinshed. It was built c1933 on land subdivided from the nineteenth century mansion estate Medindie (formerly ‘The Elms’). 2-Ledbury-Court-Toorak.pdf The large double-storey Old English style house at 20 Heyington Place, Toorak was constructed in 1933 to designs by architect A Mortimer McMillan. It was built on land subdivided from the grounds of the nineteenth century mansion Dalmeny. La Chaumiere, 219 Kooyong Road, Toorak is a large double-storey interwar house with a hybrid French provincial/English Domestic revival character. It was constructed in 1932 to designs by prolific interwar architects A & H L Peck, on land subdivided from the grounds of the c1891 mansion Dalmeny. 219-Kooyong-Road-Toorak.pdf The building at 22 St Georges Road, Toorak is a double-storey English Domestic Revival style house with a circular conical roofed tower recalling French provincial architecture. It was built in 1937 to designs by noted architect Edward Fielder Billson. The property was created out of the Toorak House mansion estate. The house at 221 Kooyong Road, Toorak is a large double-storey Old English style residence.It was built in 1933 on land subdivided from the grounds of the late-nineteenth century mansion Dalmeny. and Martin. The house occupies a subdivision of the Illawara mansion estate. house was built on land subdivided from the grounds of the 1880s Eilyer mansion. 28-Albany-Road-Toorak.pdf High Branches at 38 St George Road, Toorak is a double-storey English Domestic Revival style building erected in 1937 to designs by noted architect Geoffrey Sommers. oeuvre but it nonetheless demonstrates a skilful handling of the Old English mode. constructed c1934 to designs by accomplished interwar architect A Mortimer McMillan. It was built on the grounds of the nineteenth century mansion Medindie (formerly The Elms). c1932 following the demolition and subdivision of the nineteenth century mansion Montalto. Glenbervie. The house was constructed by, and possibly also designed by, prestige builders Dickson and Yorston. dwelling erected in 1927 to designs by prolific interwar architects Arthur and Hugh Peck. It was built on land subdivided from the 1880s mansion Eilyer. Houses in the former City of Malvern which derive from Old English or English Medieval styles identified in heritage studies of the City are listed below. The style group can be further broken up into places which have an Arts & Crafts or English Domestic Revival basis, that date typically from the Edwardian-era and around WW1, and those which resemble the suburban Old English style of the house at Monaro Rd that are typically from the late 1920s but more typically the 1930s. The latter type has the characteristic main hipped roof, with projecting half-timbered gable, clinker brick walls, stained `oak’ beams exposed on the exterior at porches and timber framed often grouped windows with diamond panes. Glyn is not just one of Melbourne’s grandest mansions. It is also one of Victoria’s most significant homes, an arts and crafts classic that represents the pinnacle of this distinctive style. Architect Rodney Alsop designed Glyn in 1908 as a statement of wealth and privilege for the financier, banker and politician, Sir Edward Miller. It’s a trophy house with a rich and colourful history. The renowned architect Harold Desbrowe Annear designed the two-storey house in the Arts and Crafts style in 1911 for Charles Engholm. In the 1930s Marcus Martin, a young architect working in Desbrowe Annear’s studio, completed alterations to the house. Marcus went on to become the darling of Toorak and South Yarra society, designing and renovating houses in both suburbs. This picturesque English style cottage at 2 Stonnington Place is notable for its simple single ridged slate gable roof containing attic rooms with flat deck dormers. The former Player house was identified as a significant building in the City of Malvern Heritage Study (Nigel Lewis and Associates, 1992). The later Individual Heritage Place Citation prepared by Graeme Butler and Associates (March 2002, updated October 2003) identified the dwelling as a being of ‘local significance’. Glyndebourne Avenue, created in 1919 with the subdivision of the ‘Glyndebourne’ Heights Estate, was well placed to attract home-owners expecting the latest in architectural styles. Windarring. (2 Glyndebourne Ave) Double storey interwar villa with attic storey. Divided into units, Heritage Overlay Number HO180. This striking two-storey Craftsman style house was designed by the accomplished partnership of Oakden and Ballantyne, forerunners in the American Bungalow style, with low gables, overhanging roofs, heavy beams, rough-cast walls and flat roofed verandahs with thick pylon supports, was quickly gaining momentum. The sale of 19 Moorhouse St further showed how sought-after homes at the top-end of the Melbourne market have been in recent weeks, coming shortly after three properties in other prestigious suburbs flew more than $1 million over reserve. Mr Chiminello had been asking $6.2 million-plus for the recently renovated 1923 family residence. Five families competed in the early auction, pushing the sale price past $7.5 million, with the party who’d made the offer missing out on the house. The house at 13 Myamyn Street, Armadale is an attic storey English Domestic Revival style building with Shingle style overtones. It was built c1926 to designs by the noted interwar architect Robert Bell Hamilton. This stunning Period residence with an in-ground pool and spa is infused with elegant glamour and designer chic. Both indoor and outdoor spaces are testament to the artisan design and superior quality from the travertine lobby to the banks of picture windows, magnificent gardens, luxurious finishes and the latest in home living and entertainment spaces. The Old English style house at 4 Moonga Rd (corner Merriwee Cr) designed by architect Walter Mason was called “The house of today” by the Australian Home Beautiful in 1932. A large Old English style house, with strong rood, building forms and massings. The large gables are similar in form to Alsop and Klingender’s Wertheim residence at 13 Whernside Avenue Toorak. Overlooking a well established northern garden on an allotment in excess of 13,000 sqft, this superb English style four bedroom plus study residence offers an outstanding family environment with a wonderful blend of spacious light-filled formal and informal living areas all with beautiful garden aspects. The large double-storey Georgian revival style house at 35-39 Albany Road, Toorak was constructed c1941 to designs by accomplished architect Geoffrey Sommers. It was built on land subdivided from the grounds of the 1870s mansion Kenley, and was Sir Keith Murdoch’s home in the late 1940s and early 1950s. In 1932/33, architect Arnaud Wright designed a number of the Old English style houses on the west side of Power Ave including 23, 21, 19, 17 and 15. A simple attic cottage designedt by Rodney Alsop and Marcus Martin. One of the more evocative Old English style houses in Toorak. It was pictured in the cover twice and in detail in another issue, making it among the most publicised suburban home designs in the inter-war issues of the periodical. A distinguished Old English style attic gabled residence. The windows are a simple Georgian revival style, with shutters. Of Victorian State significance as the high point of the career of architect Arthur Plaisted after his early success with Hartpury Court in Elwood, and before he fell out of favour after trenchant criticism by Robin Boyd over his Castle Towers project in South Yarra. The chimneys are powerful elements projecting above extended chimney breasts with a pair of angled chimneys dominating the view from the street. Visible Tudor style window casements. A fine example of the picturesque Old English style by Architect Arthur Plaisted. The character of the projecting car garage form is a clever device that adds complexity and interest, while concealing its true function. This apartment complex represents the high point in Interwar development of apartments set in garden courts and designed in the Old English style. These flats are an elaborate design using Old English style. A particularly fine example of an Old English style development which provides a dominant character to this important corner of Hopetoun Road. Burnham, as designed by Robert B. Hamilton and constructed in 1932-3, is significant. The significant attributes are the Old English style form, materials and detailing of the flats and garages, front and side brick fences. The high level of external intactness and wide range of decorative and quirky detailing that is typical of Hamilton including uniquely designed screen doors with inset panels, the bracket with name plate and light fittings etc. are integral to the significance of the place. Historically, it is significant as one of the first examples of the Old EnglishLuxury flat type designed by Robert Hamilton to resemble a large single-family home, an approachthat he would use in many of his subsequent developments. Hamilton was one of the most important and influential designers of Luxury flats in Toorak and South Yarra and this development of four large single-levelflats together with ‘Haddon Hall’, which is of a similar design, but comprising maisonettes demonstrate the two approaches used by Hamilton over the next decade either in separate buildings or in combination. A Landmark residence of Historical significance recently restored and set on majestic established gardens of 36,000 sq ft approx. Colinton, 92 Mont Albert Road Canterbury was built in 1926 to the design of the architectural firm Barlow and Hawkins as the family home of Walter Gillespie of the noted family of flour millers. The inter-war Tudor style house is set well back on its large corner block to allow a picturesque view of the house across the garden. The picturesque is accentuated by the sweeping driveway and by the oblique siting of the house which gives emphasis to the three dimensional form of the design. The steep pitched, shingled roof with its ‘swept valleys’ is well composed and can be appreciated from the street. The tall clumped chimney flues, small paned windows, and the half-timbered surface treatment all add to the romantic illusion of a substantial English country house in a park setting. This illusion is carried through into the interior, mainly in the stair hall, dining and sitting rooms. The four elevations are studied and are substantially intact, particularly on the north, south and east sides. The working drawings for the house, signed by FG Hawkins, are in existence and the house displays a high degree of integrity and intactness particularly in respect of the roof, chimneys, major windows, brickwork and masonry finishes, stair and stair hall, sleep-out, lighting fixtures, doors and door furniture, switches, bell systems and joinery. As well, the garden setting with its several early plantings, its sweeping gravel drive, its imposing front gates (replicas of the originals) and its open lawn giving a clear vista of the house, remains faithful to the original design concept. Marcus Barlow was a skilled publicist and Colinton was featured in an extensive article in the leading magazine Australian Home Beautiful in May 1927 as well as in Barlow and Hawkins’s showcase publication Australian Homes also published in 1927. The Gillespie family owned Colinton until 1935 when it was purchased by the Beecham family of the timber industry. Other owners have included Walter Higgins, company director and Arthur Goode the noted stockbroker. In 1992 the property was purchased by Max and Jane Chester. During 1962 under the Goode ownership the south west service wing was added to the design of architect David Nall who also converted the guest bedroom to allow access to the garden. Apart from the excision of one house block on the east side, the property has retained its extensive garden setting. Combe Martin is a two-storey brick residence constructed as a holiday house for the successful iron and steel manufacturer, Charles Ruwolt and his family in 1939-40. Combe Martin is architecturally significant as an unusual and accomplished example of interwar architecture in the Old English style and as an unusual example of the work of the prominent Melbourne architectural firm of Norman Seabrook and Alan L. Fildes. The house was designed in the Interwar Old English style by the noted architectural firm of Seabrook and Fildes and is elaborately detailed, inside and out. Combe Martin is historically significant for its association with the engineer and manufacturer, Charles Ruwolt, whose iron and steel manufacturing firm was one of the largest in Australia. The house demonstrates its association with Ruwolt in much of its detailing in metal, produced in the Ruwolt foundry. Historically, Gowrie Court is significant as ‘Luxury’ residential flats designed by Robert B. Hamilton who was the leading designer of this type of flat development in Toorak and South Yarra during the inter-war period. The mix of flat types – in this case a maisonette, large family flats and one bachelor flat – is characteristic of Hamilton’s developments of the late 1930s. The inclusion of the ‘bachelor’ flat is of note as a rare example of a ‘Luxury’ flat specifically for single people or couples. Haddon Hall, as designed by Robert B. Hamilton and constructed in 1931-2, is significant. The significant attributes are the Old English style form, materials and detailing of the flats, front and side brick fences, the garden setback to Toorak Road with semi-circular driveway. Historically, it is significant as one of the first examples of the Luxury flat type designed by Robert Hamilton and represents his prototype of maisonettes designed to resemble a large single-family home that he would use in his subsequent developments. Hamilton was a pioneer of maisonette developments, which were promoted as a practical alternative to a detached house and was the forerunner of the post-war townhouse. Architecturally, Haddon Hall is significant as a highly accomplished and externally intact example of inter-war flats designed in the Old English style. Details such as the fine brickwork and fachwerk, massive corbelled chimneys, and entrance gates with silhouette panels and lanterns, as well as its setting with a curved drive and original brick fence all contribute to its significance. Also for its association with Robert Hamilton, Victoria’s foremost practitioner of the inter-war Old English style. Two storey inter-war’Old English’ style maisonettes, designed by P.J. O’Connor (Please refer to precinct citation). Very intact. Significant features include the building, random stone with tile coing front and side boundary fence and garages at rear. Designed by P.J. O’Connor, c.1933. designed by Arthur W. Plaisted and constructed in 1936, is significant. The significant attributes are the Old English style form, materials and detailing of the flats as designed by Plaisted. Architecturally and aesthetically, Muyanata Flats is a good example of the flat designs of architect Arthur Plaisted, who is known for his mastery of many different styles in his inter-war designs and is particularly noted as a pre-eminent designer of Old English style flats. The flats are distinguished by the attention to detail and unusual use of rough, rustic finishes to add authenticity to the Medieval design. While ‘Luxury’ flats in Stonnington were designed by a number of architects Robert B. Hamilton appears to have been the pre-eminent designer of luxury flats in Toorak and South Yarra – Sawyer (1982:68) cites a 1938 article in the RVIA Journal where Hamilton pointed out that there was demand in the South Yarra district for flats ‘which provide accommodation for more affluent residents’. Denby Dale (c.1938) are currently listed in the HO and four more were assessed by the Residential Flats 2012 study. Taunton, designed by Robert B. Hamilton and Associates and constructed in 1936, is significant. The significant attributes are the Old English style form, materials and detailing of the flats, low brick garden walls, garage and front fence and lych gate, and the garden setting. The high level of external intactness and wide range of decorative and quirky detailing that is typical of Hamilton including uniquely designed screen doors with inset panels, the grotesques to the lych gate etc. are integral to the significance of the place. Architecturally, Taunton is a highly accomplished and externally intact example of interwar flats designed in the Old English style. Aesthetically, the flats are distinguished by their skillful modulation of roof forms, projecting bays, window types and cladding materials to break up a long building and create the sense of an intimate Medieval village. Details of particular note include the Japanese-influenced lych gate with carved grotesques, and the rare use of terracotta roof shingles and hung tiles. Also for its association with Robert Hamilton, Victoria’s foremost practitioner of the inter-war Old English style. Westerfield is architecturally significant as an example of the rural retreats built by Melbourne’s wealthiest families in the 1920s. It is an outstanding example of an innovative Arts and Crafts style house and garden, designed in 1924 by the prominent Melbourne architect Harold Desbrowe Annear, who was a leader of the Arts and Crafts movement in Victoria. It is among the most intact of his houses, and retains many original features, including the built-in furniture and door fittings. Westerfield is historically significant for its association with Sir Russell Grimwade, a man of extraordinary diversity, active in some of Australia’s largest and most enterprising business concerns, particularly in the chemical and pharmaceutical industries, and prominent in such bodies as the National Museum and the University of Melbourne. Grimwade was an early advocate for nature conservation, and had a great interest in native plants and their cultivation. Russell Grimwade (1879-1955) was one of Australia’s outstanding industrialists, scientists and philanthropists. He was trained in science, was chairman of numerous chemical companies, including the family pharmaceutical business, Felton Grimwade & Co, which later became Drug Houses of Australia, and of the Victorian Board of Scientific and Industrial Research. His interests included arboriculture, carpentry, photography and forestry, and he was an enthusiast for native plants who published an Anthology of Eucalypts in 1920. At Westerfield he began to plant what became a collection of more than fifty species of gums, as well as acres of lavender and roses, from which oil was distilled. With the onset of World War II Australia’s supply of many essential plant-derived drugs was cut off, and Grimwade, with the aid of the Federal Government, obtained seed from England and cultivated at Westerfield crops of poppies, foxgloves, deadly nightshade, henbane and colchicum. He constructed a drying shed, and with the resources of the family firm’s laboratories developed extraction techniques to produce many of the drugs essential for Australia’s war effort. The plan is unconventional with three wings radiating out from a central stair hall. The house has no corridors, and many rooms have unusual shapes. The interior is remarkably intact, with many original details such as built-in furniture and door furniture. Much use was made of stained timber, for floors, skirtings, architraves, doors and built-in cupboards, but some is now painted white. A small timbered tower containing a water tank rises from the centre of the cement-tiled roof. In the angle between two wings is an east-facing semicircular porch, now glassed in, axially aligned to the main garden path. Above the porch is a balustraded deck, intended as a lookout towards Westernport Bay. To the south of the house are a caretaker’s cottage and a garage. The landscape still reflects the original design, with distinct but integrated features. Arthur and Hugh Peck NB for such a prominent architect, biographical and practice data is definitely lacking! Geoffrey Sommers NB A biography and list of works needs to be assembled for this society architect!